ROXBORO, N.C. (WTVD) -- The Roxboro police announced they will hold a meeting Monday to talk about the KKK event that happened on Saturday. The news conference is scheduled for noon. On Saturday afternoon, about 20 people displaying KKK flags drove through Roxboro. Police blocked several intersections and the group was out in about five minutes. Police Chief David Hess said officers blocked the intersections to ensure the public's safety. Hess noted that while the event was not something they desired, they could not legally prevent it. In a statement about the news conference, Hess said the police department understands the KKK presence invoked raw emotions. He asked for community to remain calm. In May, the KKK distributed recruitment fliers in the area targeted towards people who support the controversial HB2 law. The group said LGBT rights, interracial relationships, and immigration are against their beliefs. The local group formed three years ago and claims to have 50 members. One of the leaders of the group told ABC11 in May that they are standing up for "our race and we have that right." The City of Roxboro ackowledged the group's First Amendment protections but said they would not tolerate any actions against citizens by groups who have a mission of racial, sexual, religious or any other kind of intimidation. 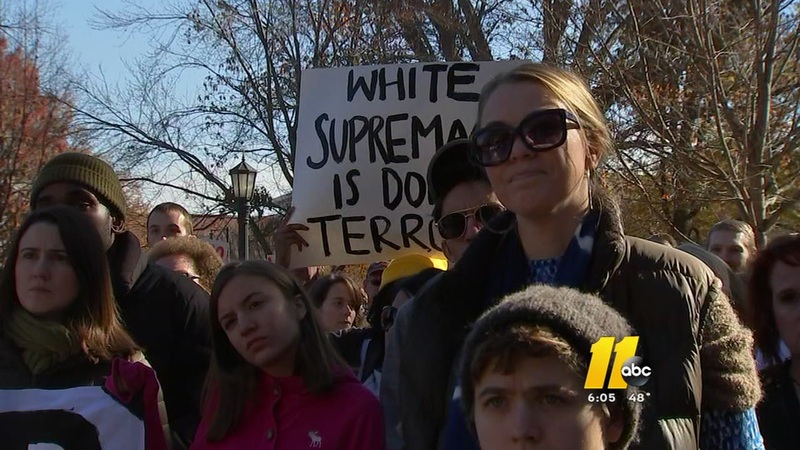 A large crowd gathered in Raleigh's Moore Square Saturday to voice their opposition to KKK and those who spread hate.